The fish stall at the base of the building is Ishiyama Shoten. 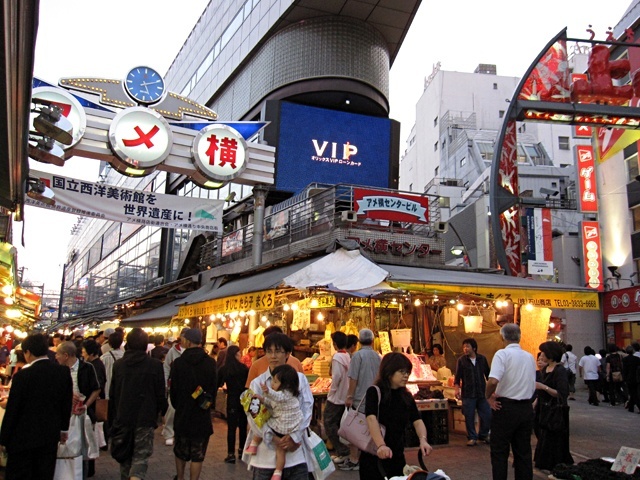 The large building in the center is the Ameyoko Center Building. Closed the third Wednesday of each month except for December. In the basement of the Ameyoko Center Building there is a handful of shops with fresh seafood, meat, and dry goods. What makes this worth visiting is its collection of spices, fresh herbs, and produce for Southeast Asian cooking. Here you will find many ingredients for cooking Thai, Vietnamese, Chinese, and Malaysian food. Rice paper, curries, noodles, fish sauce, and other ingredients that are often not sold at local supermarkets are available here. This shop is at the fork when you enter into Ameyoko. Here you will start to hear the men with low, grating, guttural voices. Ishiyama specializes in tuna and you will find large red blocks of glistening raw tuna to smaller saku cuts (to make sushi or sashimi at home). These all are sashimi quality. Ishiyama Shouten also sells other seasonal seafood products including crab, salmon, and other seasonal fish.